NOTE: This entry contains gif's that I didn't make. I dl'd off of Spladdle blog and uploaded to my pichost to save on original gif-maker's bandwith. My thanks to the unknown gif maker(s). Let's take a look at Lyoto 'The Dragon' Machida. The buzz around Machida is that he is elusive, currently undefeated, and that his background is Shotokan Karate. To be trained in a traditional martial art and to be successful in MMA is a rarity these days as the MMA fighters of today seem to train a blended MMA hybrid style of BJJ, Muay Thai, boxing, and wrestling. It seems MMA has turned to the TMA to get an edge in MMA competition. 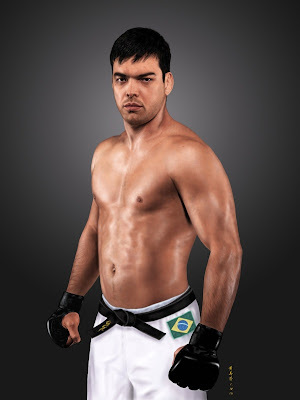 Lyoto Carvalho Machida (born May 30, 1978) is a Brazilian mixed martial arts (MMA) fighter currently fighting as a light heavyweight in the Ultimate Fighting Championship (UFC). The son of a Japanese-Brazilian Shotokan karate master, Yoshizo Machida, Machida holds an undefeated record that includes victories over former UFC light heavyweight champion Tito Ortiz, former UFC middleweight champion Rich Franklin, and current UFC lightweight champion B.J. Penn. He is currently ranked as the #2 and #4 light heavyweight fighter in the world by MMAWeekly and Sherdog respectively. Machida is noted for his karate-influenced striking style that implements an unorthodox stance and an elusive strategy. Machida fights out of Black House. Some animated pictures of his takedowns. A friend (ronin) says the punch to sweep takedown is from Shotokan. 1st one is probably in other MA, but when I first saw it, my knee-jerk reaction was that it's a silat takedown called, IIRC, Kengit Siko. How would you describe this takedown? Funny, if you showed someone a highlight or a bunch of GIFs of Lyoto, they would think he was a ridiculous, technical machine....which he clearly is, but if you told them these ninja moves were done rounds or fights apart, they would be flabbergasted. I think anyone watching the GIFs or highlights would come away thinking that this is simply how the guy fights....just beating the sh!t out of everyone. Truth is that there's at least 5 minutes between these ninja moves! This is part of Machida's elusiveness… he picks his spots… counter-attacks. When I saw some of his fights, I was probably like a lot of the typical MMA fans, looking for an exciting match with a knockout for the payoff. I initially felt bored watching his fights. But as I watched more of his fights, I realize what was going on. He is an excellent technician. Great tactitian and sticks to his strategy of counter-attacking. This all adds to his elusiveness. He thoroughly frustrated Tito Ortiz when they fought. Ortiz is quoted as saying, "He’s very elusive and it was tough to chase him down, he’s a great fighter." I've noticed Machida does something with his body which I call the Machida Sway. He sways/rocks his body to and fro, kind of like what the Dog Brothers call the 'snaky stick'. The stick hand is always in motion to mask the intention of a strike. Machida seems to me the same when he sways his body. In a future entry, I will take a look at his feinting... the Machida Sway. Machida will be facing 'Sugar' Rashad Evans for a shot at the Light Heavyweight title. Good luck Lyoto Machida! That kinjit like take-down that Machida does can be seen in a Youtube clip called "This is Karate" - it's basically like a kinjit from the waist down but more like a sapu from the waist up. I've never seen it done live before Machida. The punch-sweep combo that Machida loves to do is a pretty common combination amongst Shotokan stylists. That leg trip he does off the clinch is called kosoto-gake in Judo but I imagine it exists in Sumo (which is one of his base arts) as well as every wrestling style out there plus a few striking styles that utilize the clinch (like Muay Thai). I forgot to mention - there's a clip of Machida in his fight against Evans where he does a front kick-punch combo. You can see him going for one of his take-downs, either the kinjit like take-down or his dae-ashi-barae (the sapu like take-down) but it turns out to be unnecessary as either the kick or the punch (or both) sent Evans falling. But you can definitely see him stepping in to do it and then stop. thank you for your comment. awesome info!